What To Look For When Choosing A Safety Padlock? Safety padlocks are hard to get past, and prove more effective in restricting access than safety tags and other purely visual indications, which may go unnoticed. Here are some factors that can help with the selection. Steel – Padlocks made from steel are exceptionally durable and tensile. They are also capable of withstanding exposure to high temperatures and corrosive substances. Aluminum – This material is a close competitor to steel, nearly as strong and durable, but is also resistant to ultraviolet rays and other chemicals, apart from withstanding high temperatures. Anodized aluminum variants too are available for use in the food processing industry. Non-Conductive Material – Ideal for lockout electrical installations and highly sensitive environments such as hospitals or mines, safety padlocks made from such material are insulated from accidental electricity surges or seepage of residual power. Composite Material – Composites, especially the branded ones from GE Plastics such as Xenoy®, Zenex™, are specially formulated products (polyester, polycarbonate, glass fibers and minerals) that are resistant to temperatures, corrosives, chemicals, UV radiations, and are water- and damage-proof. They are also quite light to carry and, hence, highly portable. A range of safety locks in steel, brass, thermoplastics and other material from established brands such as Lockout Safety, Master Lock and Brady are available on www.lockoutsafety.com. Usually, each lock is paired with a different/unique key to ensure security. However, it is very much possible to have a set of locks operable with a single key. This especially can prove more efficient and effective when it comes to safety locks used for lockouts. 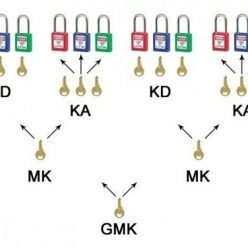 Each employee or technician is usually provided with their very own set of locks keyed alike, so that the employee needs to use just one key for all the locks at his disposal. A padlock caddy from www.lockoutsafety.com and one single key is definitely easy to handle. Then, there is, of course, a master key, ideally available with a supervisor or higher authority that can be used with again a set of locks, used for a specific company, facility or department. There are specific safety padlocks that have been designed to retain the key until the shackle is firmly clamped, making it impossible to remove the key if the locking mechanism isn’t in place. The locks featured on www.lockoutsafety.com cater to diverse keying options to match specific needs. We supply locks from a host of international brands. We are the authorised agent for Masterlock Ireland. Padlock identification enables people on the shop floor, factory setting or any other work environment to note that a given area or machine has been cordoned off until further notice. The safety locks can be customized with laser engravings, personalized tags or brightly painted colours and words to make them more effective. However, the material used in the paints should match industry-specific requirements. Apart from serving as prominent visual and physical restriction, padlock identification usually also holds crucial information on the technician who is servicing the area/equipment, the nature of problem, the estimated downtime, etc. Locks can also sport photo IDs to make identification easier. Ideally, each technician will have a set of tagged safety locks, preferably keyed alike to make the lockout process simple and fast. Besides the identification options that can go on the padlocks, specific lockout tags too can go well with safety locks. Attaching lockout tags to the shackles of locks presently in use can also prove a cost-effective way to conform to safety standards. 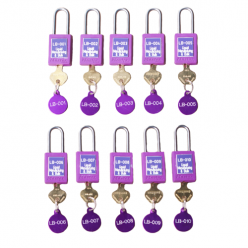 Padlock accessories at www.lockoutsafety.com can cater to requirements of lockout tags and safety chains to make best use of existing locks.